Update September 8, 2016: Blizzard have released some official numbers to back up the statements made at PAX last week. In a press release, Blizzard have revealed some more exact WoW: Legion sales figures. By August 30, it had sold through “more than” 3.3 million copies, matching the previous records set by other expansions and, by the best data we have, making it “one of” the fastest selling PC games ever. 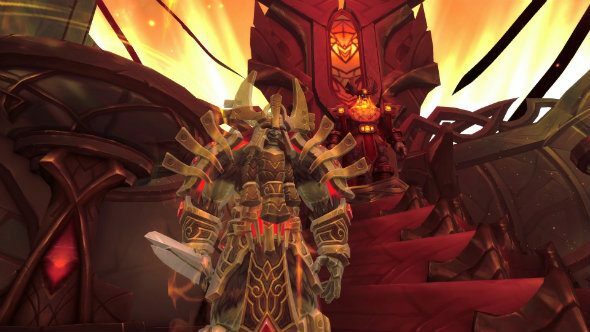 If you’re thinking of getting the expansion, check out our WoW Legion review. Perhaps more interestingly, they also say that “launch-week player concurrency climbed to its highest point since the 2010 launch of Cataclysm.” As discussed below, player concurrency doesn’t necessarily represent subscriber count, but given the start of Cataclysm was the game’s all-time peak of 12 million subs, that bodes very well for the future of the game. Another comparison to make is this means it broke whatever concurrency record was set by Warlords of Draenor. The sales figures given for WOD were a similar “more than 3.3 millionas of the first 24 hours of the expansion’s availability” and hitting the 10 million subscriber count for that month. This was before they began to use player concurrency as a mark of success, however, so no details on that were provided. At best guess, it means Legion has performed better than Warlords overall, and similarly in terms of hype generated for launch. Despite misgivings about how WOD was handled, clearly there are plenty of players willing to come back for a new expansion. Whether they can be held on to this time – three million left the game within four months after Warlords – remains to be seen. For what’s coming next, have a look at our World of Warcraft patch 7.1 roundup. Original story September 5, 2016:Speaking at a PAX panel, Blizzard have revealed a bit about WoW Legion’s success, suggesting it at least achieved expectations, pushing the concurrent player count to its highest point “in recent memory”. “We knew this expansion was going to be something for the books, but reception has just blown us away,” Blizzard said during a PAX stream. “The early reviews are coming in, they’re really positive. Fan reception has been phenomenal. For reference, this means the number of players logged in at once, not the active number of subscribers. It could mean sub numbers are as high as Warlords of Draenor’s peak (10 million) but Blizzard are committed to not giving that info out anymore. Despite being PC only and available digitally, Legion also debuted in the UK physical chart at number three. Boxed sales of Legion fall short of Draenor’s, but it is still this week’s highest new entry, debuting just behind the multiplatform Deus Ex: Mankind Divided. It’s the highest single-platform release of the week, too. There’s a lot of other interesting stuff in that PAX panel video, like information on how Demon Hunters didn’t feel right for the longest time, but the custom emotes, VO, animations and other work solved that. Or how the team took the parts of Garrisons that worked and modified them to include in Order Halls. This follows the announcement thatLegion is getting a companion app. It’s also been announced that fan-favourite RaidKarazhan is returning to the MMO.